[color=#FF8000]On 28 Mar 2013, 10:46[/color] ame wrote: a sunny morning. party is over: bones picked clean. Still a raven and sick raccoon dogs came to check in the afternoon if there is anything left. [color=#FF8000]On 28 Mar 2013, 18:24[/color] ame wrote: an invitation for mating... this is so clear: a female raven is begging for it but the cold-hearted male just keeps eating... it even chases the female away. [color=#FF8000]On 28 Mar 2013, 20:47[/color] ame wrote: just now there was some raccoon dog racket but my screen is all black. 00:17 the moonlight wasn't as bright tonight as it was in earlier nights. macdoum wrote: Just now another lovely moonlit feeding site 02:46 . Beautiful. Some black woodpeckers were calling in the morning. Also a buzzard called. 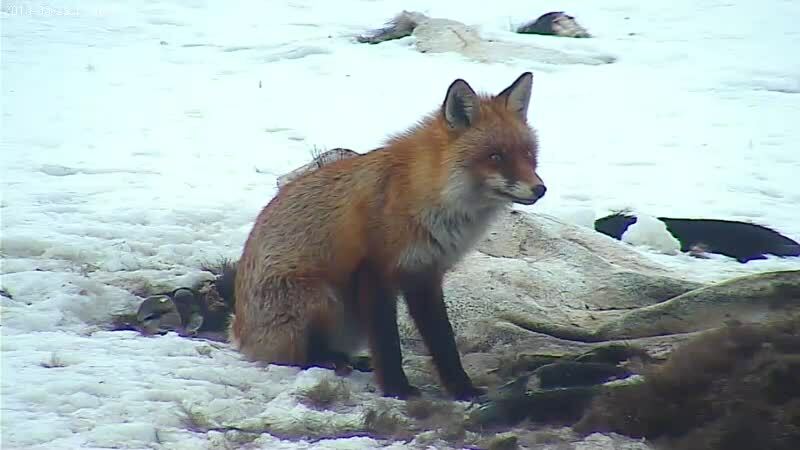 Visitors were getting fewer and fewer towards the end of season: a fox, some ravens and some raccoon dogs. ... and a raven calls. 6:22 a flock of siskins (?) flew by. 7 am: two magpies were eating. ame wrote: some ravens have come see if there's breakfast. still they seem to find something. [color=#FF8000]On 29 Mar 2013, 13:58[/color] ame wrote: the fox with slightly bad tail (but enough bad) is eating. there seems to be something left in those hides, in the feet. ahaa, and now i see why the pile there has looked so dark: someone has turned the hide so that the dark hair outside is on top. ame wrote: one of the very sick raccoon dogs was eating for a long time at about 4 pm and after that. now [5 pm] there's one raven picking the skins. ame wrote: empty forest opening, only few raven and crow calls from far. [color=#FF8000]On 30 Mar 2013, 10:07[/color] ame wrote: every time that i have looked it's been empty. it's getting cloudier i think. 11:06 some sort of an alarm sounded for a while! [16:56] the crow stopped cawing and decided to land to eat. snowing gets thicker. ame wrote: 6:01 one raven is eating. it's quiet. ame wrote: 12:20 the camera had disconnected. just a few minutes earlier it was still on. these are my last pictures. 12:05 sky was covered with clouds. That was the end. Thank you for your attention. PS. If you find any mistakes please don't hesitate to contact me and point them out. Renno made a graph showing the daily numbers of eagles at the feeding in the period 30 Dec 2012 - 24 March 2013. He has estimated the numbers of all eagles based on the pictures and reports posted on the forum. The numbers of all eagles are minimum numbers: it is not an easy task to count unringed eagles and some eagles may go uncounted for. During this period 172 observations of ringed eagles were made. The estimated number of all eagles visiting the feeding area was 588 in the same period. The ratio of ringed eagles to all eagles is 29 %. Taking into account that the all-eagle numbers are lower limits, this means that for each ringed eagle at least two unringed eagles visited the feeder. After Renno made this graph one more ringed eagle was seen at the feeding ground on March 25th and 26th. 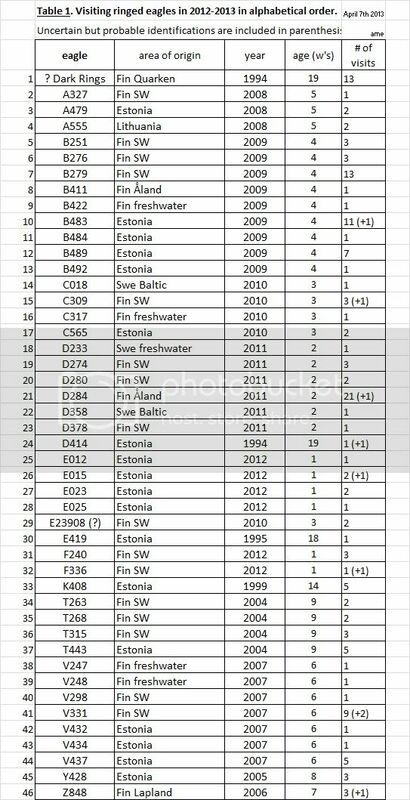 Table 1 gives an alphabetical list of the ringed eagles which visited the feeding ground this season. The ring codes of 44 eagles were read. Besides that there were two ringed eagles whose codes could not be read for certain. First of them was the eagle who was called Dark Rings. Its rings were oxidized so that even the colours of the rings were mostly invisible. Enough was seen so that it was concluded that it was ringed in 1994 in Finnish Quarken area. The other uncertain case was a young SW Finnish eagle who had only country ring on its right leg. The ring was, however, photographed well enough so that numbers 2390, possibly followed by 8, could be read. In Finnish rings there is also letter E in front of the number. The bird was estimated to be born in 2010, i.e. it was on its 3rd winter. The following tables summarize the native areas, natives countries and age distribution of the ringed eagles which were seen in this season. Thank you aita for your corrections!